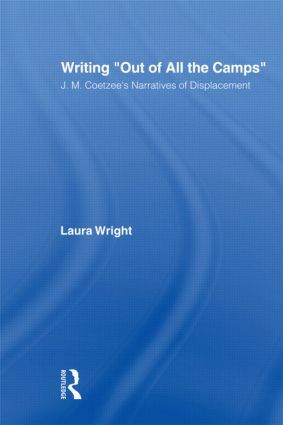 Writing "Out of all the Camps": J. M. Coetzee's Narratives of Displacement is an interdisciplinary examination--combining ethical, postcolonial, performance, gender-based, and environmental theory--of the ways that 2003 Nobel Prize-winning South African novelist J. M. Coetzee, primarily through his voicing of a female subject position and his presentation of a voiceless subjectivity, the animal, displaces both the narrative and authorial voice in his works of fiction. Coetzee's work remains outside of conventional notions of genre by virtue of the free indirect discourse that characterizes many of his third-person narrated texts that feature male protagonists (Life & Times of Michael K, The Master of Petersburg, and Disgrace), various and differing first-person narrative accounts of the same story (Dusklands, In the Heart of the Country), the use of female narrators and female narrative personas (Age of Iron, The Lives of Animals), and unlocatable, ahistorical contexts (Waiting for the Barbarians). The work has broad academic appeal in the established fields of not only literary studies--postcolonial, contemporary, postmodern and environmental--but also in the realm of performance and gender studies. Because of its broad and interdisciplinary range, this text bridges a conspicuous gap in studies on Coetzee.